While not The Louvre, The Met or even The Guggenheim, Madrid has three top art museums that are usually high up on most tourists’ Must See List: The Prado, The Reina Sofía, and The Thyssen-Bornemisza. What most tourists typically don’t get the chance to see are the plethora of additional, less famous museums that make up Madrid’s repertoire, such as The Museum of the Americas, The Sorolla Museum, and The Museum of Decorative Art, just to name a few. And then there are the not-so-touristy and not-so-traditional options, which include the CaixaForum, El Matadero, and the Conde Duque Cultural Center, all of which I’ve had the chance to visit recently. El Matadero, meaning The Slaughterhouse, was literally just that, but has since been converted into a contemporary arts center. The sprawling campus offers various spaces holding film screenings, theater performances, art exhibits, libraries, work spaces, and workshops (almost all of which are free), and even two restaurants. During my visit, I perused an exhibit about the paper scrolls and writing tablets used in ancient Rome; I toured a unique Japanese garden; and I was inspired by an exhibit called We Traders: Swapping Crisis for City, which featured the work of designers, architects, dreamers, movers and shakers in Berlin, Madrid, Lisbon, Turin and Toulouse who are developing creative uses of existing resources to reinvigorate their local economies and communities. Examples include an artist’s collaborative, an initiative promoting urban agriculture, and a co-housing community. The CaixaForum is a cultural center sponsored by the Caixa Bank and located near the big three museums which houses, among other things, internationally-renowned traveling exhibits. I visited in the fall to catch an enchanting exhibit about George Méliès, the father of movie special effects, and I returned recently to see “Génesis” by Sebastião Salgado, a collection of works by the Brazilian photographer who traveled to all seven continents to document the landscapes, animals, and tribal people who reside beyond the lens of mainstream media. Next up on my to-see list is Pixar: 25 Years of Animation. 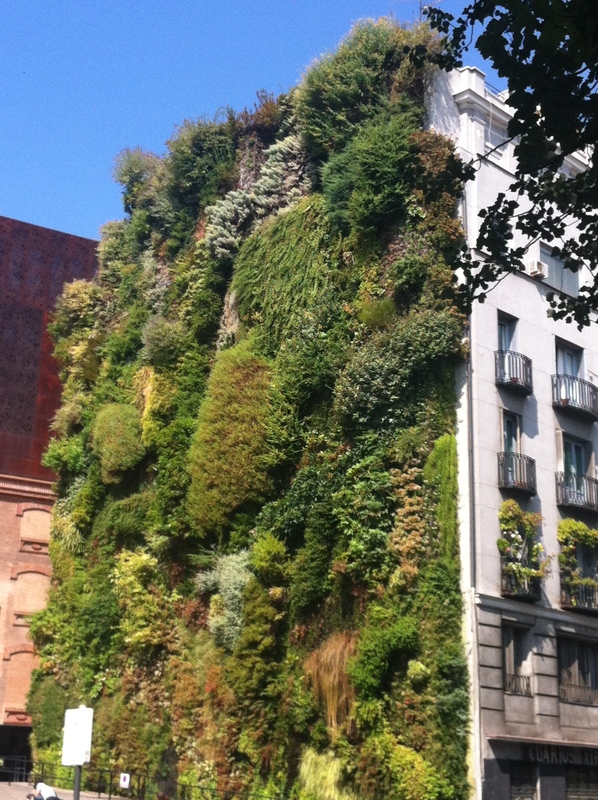 To boot, The CaixaForum is an architecturally intriguing building, with a modern facade featuring its very own vertical garden. The Conde Duque Cultural Center, located in a formar military barracks, is another multipurpose space with exhibits, performances venues, workshops and work spaces. A recent visit was highlighted by the Madrid: 1910-1935 photography exhibit of “a city in transformation,” capturing the way in which the Spanish capital sought to follow suit with other large European cities’ modernization efforts during the early 20th century. The photos displayed in the exhibit focused on the changes that were made in architecture, roadways and public transportation. As someone who is admittedly less-than-polished when it comes to classic art, an afternoon at the Prado, faced with a collection thousands of paintings and statues and drawings from centuries ago, can be daunting (though undoubtedly worthwhile). However, these alternative museums with smaller collections and rotating exhibits, have a little something for everyone, and are more accessible to those of us without an art history background. Yet another reason why there’s more to Madrid than what meets the eye in the guide book. Once a month, the former train station that is now the Museo de Ferrocarril (Railroad Museum) hosts the Mercado de Motores, a weekend-long vintage and artisan market and all around good time. From old dolls to hand-woven scarves, from quirky furniture to fabric sold by the meter, from bike accessories to high fashion heels, there’s a little something for everyone. …and that’s just the market. Then there’s the rest of the ambiance — the way the different stands are positioned between old train cars, eventually spilling out of the station altogether and into the open air; the buzz of creativity, quirk and charm, set by the products and their venders and mirrored by the attendees; the people of all ages, shapes and colors enjoying drinks and bites under the unseasonably warming sun; the laughing children riding a mini train around a small track; and the live music sprinkled throughout the venue, including a piano and saxophone jazz combo at the entrance and a crooning Michael Bublé-type serenading the outdoor diners. El Mercado de Motores is yet another gem hidden beneath the layers of one’s first or second glance at this city, that makes Madrid such a wonderful place to call home. Spring has sprung a few weeks early here in Madrid (a welcome change after its delayed arrival last year), and the past week has been all about drinks on sidewalk cafés, taking the long way home, and exploring new corners of the city in short sleeves, under the bright blue sky and shining sun. Saturday afternoon’s destination was Parque de El Capricho (capricho meaning whim or caprice), a beautiful green space located in the northeastern corner of the city. The park is only open on the weekends and entrance is free, but only a maximum of 1,000 visitors (without food, drinks, bikes or skateboards) are allowed at any one time, maintaining an air of serenity within its gates. El Capricho was built in the late 18th century by the Dukes of Osuna as an oasis away from the city center and an escape for the best artists, landscapers and intellectuals of the time. It contains a charming mix of greenery, sculptures, water elements and buildings, though I imagine its beauty will be even more impressive when springtime is in full swing and all of the flora in bloom. Although the park is an unknown to many madrileños due to its distance from the city center (approximately 40 minutes by metro), this guiri will certainly be back.